The California Department of Food and Agriculture (CDFA) presented a wealth of new information about two of their Climate-Smart Agriculture Programs at a meeting of the Environmental Farming Act Science Advisory Panel (EFA SAP) last week. The meeting included an update on a recent audit of the State Water Efficiency and Enhancement Program (SWEEP) and the first round of applications for the Healthy Soils Program. CDFA will be considering new practices to include in the Healthy Soils Program. More on the meeting, including future work of the advisory group, below. Since 2014, the state of California has invested nearly $67 million in SWEEP. 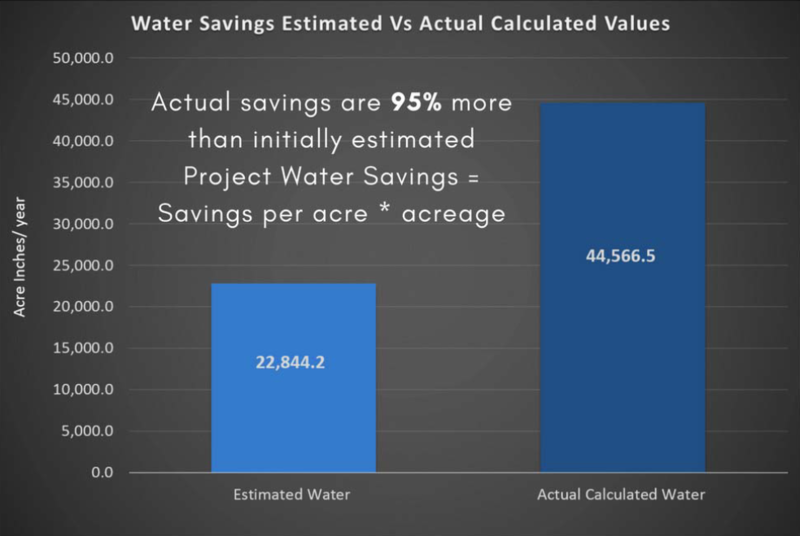 The Climate Smart Ag program funds on-farm irrigation management improvements to save water and energy while reducing greenhouse gas emissions. This highly popular program has funded nearly 600 projects throughout the state. CDFA staff’s presentation also included new analysis of the distribution of SWEEP awards by farm size and crop category. 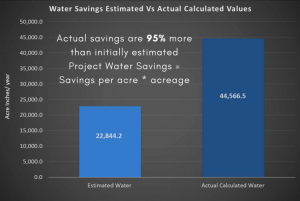 Additional audits are forthcoming, which may shed more light on why the original water savings estimates were so low. See the analysis here (starting on page 11). The application period for the first round of the Healthy Soils program closed on Sep. 19th. 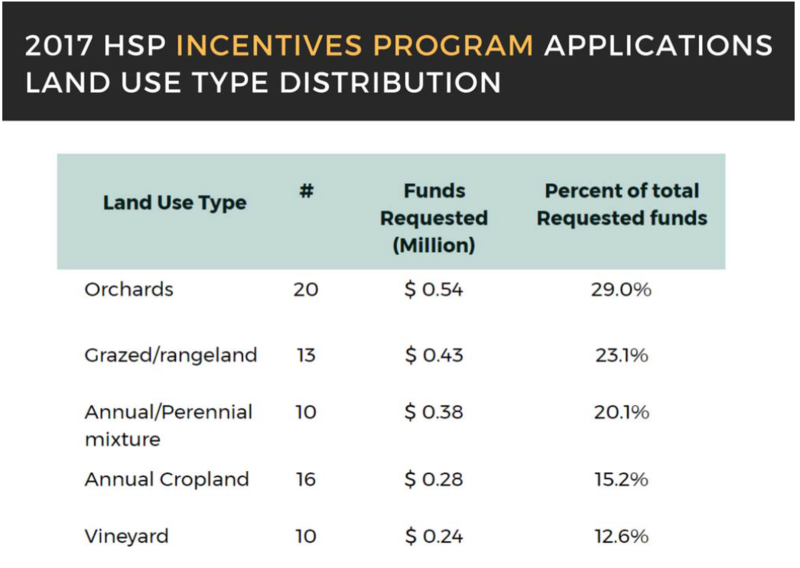 The Healthy Soils Program funds two types of projects: Incentives projects, which pay farmers fixed rates (per acre) for adopting new healthy soils practices, and Demonstration projects, which go a step further than the Incentives by requiring on-farm education and in some cases GHG research. 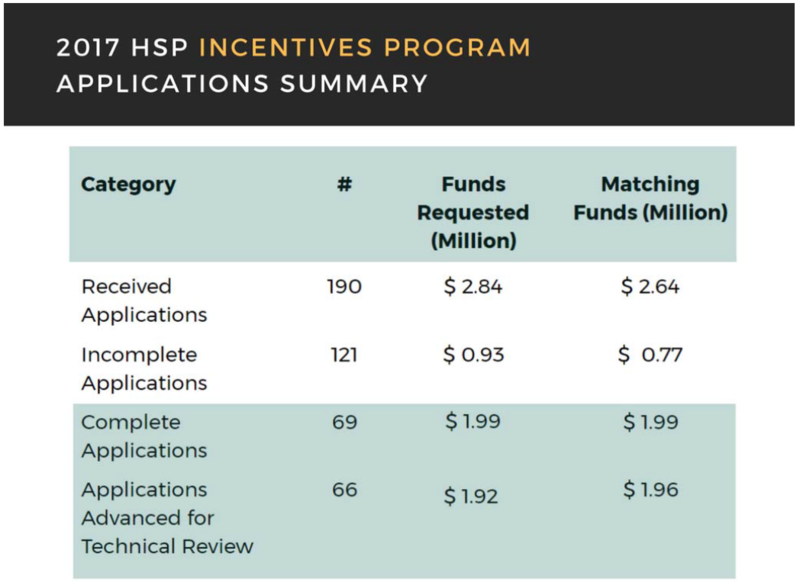 CDFA received 190 applications for incentives projects requesting a total of $2.84 million. Of those 190, however, only 69 were complete. 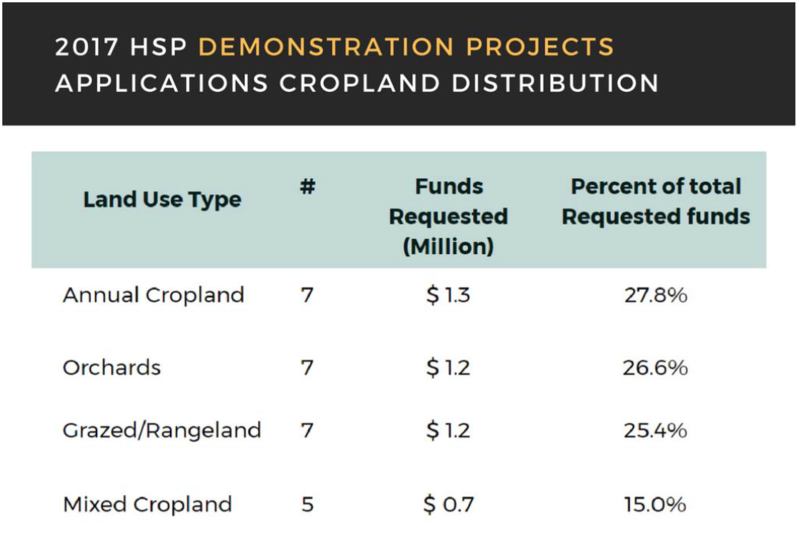 Those 69 projects were fairly evenly distributed across cropping systems. The applications were also fairly evenly distributed across the state, with applications originating from 29 counties and no single county accounting for more than 10 applications. CDFA received 82 applications for demonstration projects requesting a total of $5.9 million. Of those 82, only 27 were complete. Those 27 projects were also fairly evenly distributed across cropping systems. The applications were also fairly evenly distributed across the state, with applications originating from 23 counties and no single county accounting for more than 3 applications. 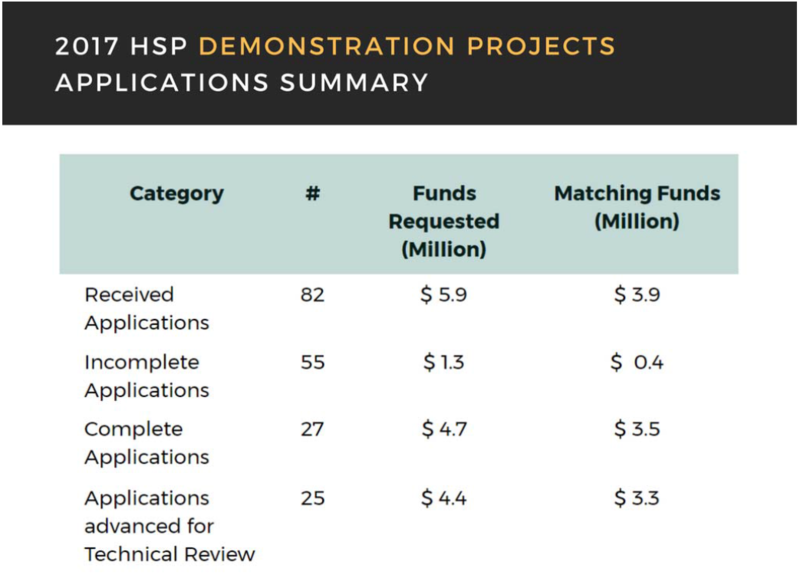 When asked by EFA SAP members about the large ratio of incomplete to complete applications for both project types, CDFA staff acknowledged that many applicants likely struggled with the short application period (only 6 weeks) and a relatively complex application. 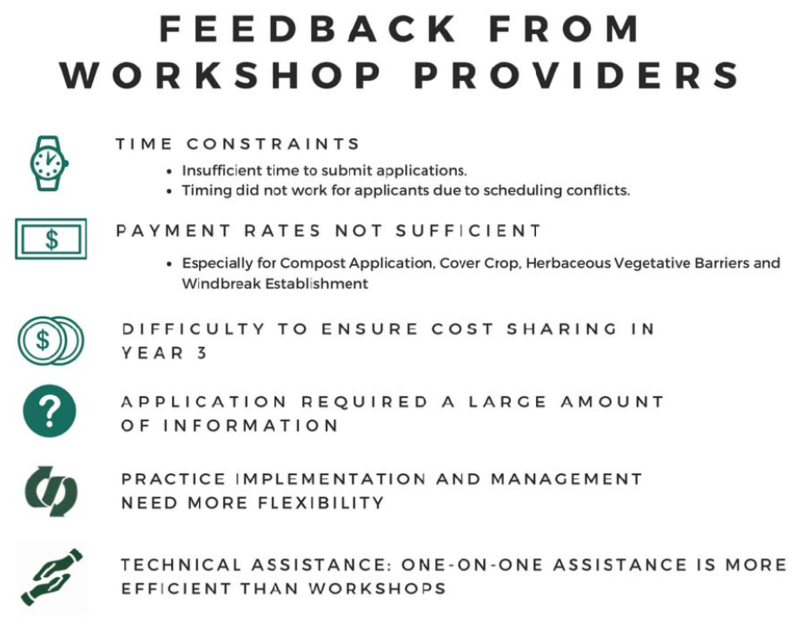 CDFA staff then shared the following feedback they had received from technical service providers who hosted Healthy Soils application assistance workshops. We heard similar feedback in our conversations with farmers and technical assistance providers around the state, which we plan to use to inform recommendations for the next iteration of the Healthy Soils program. We appreciate CDFA for quickly collecting feedback from those promoting the program on-the-ground and for promising to use the time between now and the next round to address some of these challenges with the program. Note: Healthy Soils Program awards are expected to be announced in early December. CDFA also announced at the EFA SAP meeting that they plan to release a solicitation for proposals for new Healthy Soils Program management practices any day now. We will publish a separate blogpost on that topic as soon as the solicitation is released and we know more details about the process. EFA SAP members expressed the most interest in #1 above, but also broadly shared interest in the others as well. CDFA staff suggested there would be a process for the public to weigh in on the EFA SAP’s priorities as well, but did not specify the details of that process. CalCAN will provide more details as they become available.